As much as I loved Savannah, you go there to eat....and drink...and eat some more. My friends, this isn't California goodness, its southern awesomeness-fried chicken, mac and cheese, biscuits and gravy, carb, carb and more carbs. This morning I was excited to start my journey with a new healthy drink -Cell-nique Super Green Drink. Cell-nique Super Green Drink is a USDA organic drink that energizes, detoxifies and nourishes your body with the equivalent of 8 servings of fruits & vegetables in every bottle. After eating like I was actually Paula Deen-anything that would promote itself as a detox drink was calling my name. Screaming it...actually. The great thing about Cell-nique is that it is Vegan, gluten-free, and low-calorie-it is also an energy booster which made for a great Monday! 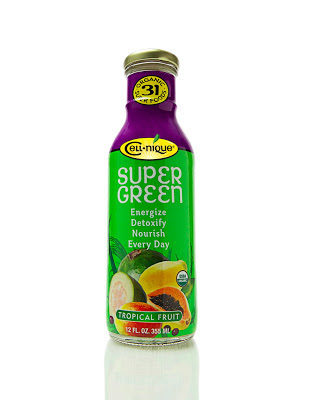 All flavors of Cell-nique Super Green contain the same 31 organic super foods. Most of the sugar count comes from the naturally occurring sugars in the fruits and vegetables, with a small amount of stevia and organic blue agave. Although all the flavors would great, the tropical fruit one was my favorite. Awesome, I'll definitely try some of these out, if not all!